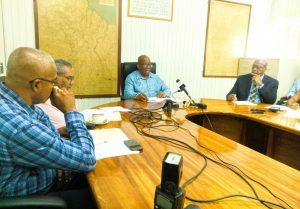 The Guyana Sugar Corporation (Guysuco) continues to be, in the words of Prime Minister Nagamootoo “a black hole,” according to Finance Minister Winston Jordan who was asked today to account for the performance of state agencies during his 2016 review. “They have benefited from low oil prices,” Jordan told the press corps, “that allow them to recover from their bottom line.” According to the Finance Minister, GPL has been able to maximise on the low oil prices to pay off interests on loans owed to Government. Opposition Leader Bharrat Jagdeo spoke to this very issue just a few days ago at the Public Buildings during budget estimates 2017. “Yet we have this unconscionable level of blackouts, and they have no plan to fix it in the future,” Jagdeo said on the state entity’s response to the blackouts.